Unless you only occasionally need the third row in the Tribeca—or they're reserved for small children—you'll probably want to go with a larger vehicle. The 2012 Subaru Tribeca has excellent all-weather handling and top-notch safety, though it's fallen behind the curve in features and interior appointments. The Tribeca is Subaru's mid-size crossover—a little larger than the automaker's rugged Outback wagon, and as the name hints, a little more urbane in purpose. That's the idea, but in reality it's hard to see why to choose the 2012 Subaru Tribeca over the Outback if they're beside one another at the dealership. While at the time of its original launch, or even when it last got a major overhaul, for 2008, the Tribeca was not only larger but more advanced and luxurious than the Outback, but now they're about the same size, and the Tribeca's only key point of differentiation is its third-row seat—which the Outback, and many other crossovers its size do not have. Updates to the Tribeca in recent model years have been kept to a minimum. In its current iteration, the Subaru Tribeca looks sleek and curvy, but not overtly so, and its styling details—at least on the outside—feel carefully calculated to offend no one. While the exterior of the Tribeca is quite unremarkable, the interior makes more of an impression. The curvy, once-futuristic cockpit-like interior of the original model remains; Its heavy-handed use of matte-metallic-finished plastics also feels very 2005, but its ambient lighting still adds a classy touch. The 2012 Subaru Tribeca is powered by a 256-horsepower, 3.6-liter flat-six engine, with torque sent to all four wheels via a five-speed automatic transmission and a symmetrical all-wheel-drive system. 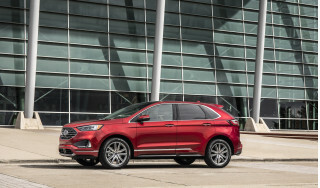 Performance from the flat-six engine is respectable, but it's not up to par with some of the other strong V-6 crossovers in this class, like the Ford Edge. Gas mileage isn't especially good for this class, with the Tribeca returning 16 mpg in the city and 21 mpg on the highway. But push the Tribeca hard into a corner and you'll find one of the Tribeca's best attributes: It has good body control and better steering than most other vehicles of this type. Plus, 8.4 inches of ground clearance and standard all-wheel drive can make this all-wheel-drive vehicle pretty impressive in deep snow. There's nothing particularly noteworthy about the Tribeca's packaging—though it does fit three rows into a manageable footprint that's pretty easy to park. Inside, the second-row bench slides fore and aft and adjusts for rake, so it's easy for adults to get comfortable; but they'll also have to balance precious legroom with the third row. In front, the seats are supportive and actually come with some side bolstering, but some will find the curvature of the dash to cut in on knee space. Otherwise, ride quality is smooth and controlled, with the same standards of refinement as in 3.6R versions of the Legacy and Outback. 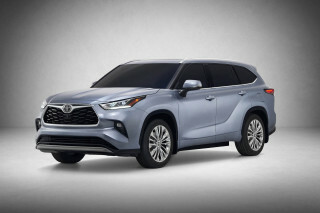 We feel confident in saying that the Tribeca is one of the safest picks among mid-size crossovers; it's scored excellent marks in Insurance Institute for Highway Safety's (IIHS) crash tests and was a Top Safety Pick for 2011. For 2012, Subaru has redesigned the head restraints; side-impact airbags for the front seats and side curtain airbags for first- and second-row passengers but not for third-row passengers remain standard. We still do recommend the rearview camera option, though. The 2012 Tribeca remains offered in Premium, Limited, or Touring trims, with the touring model gaining a moonroof, a navigation system, and a reversing camera, all as standard features. The base Premium is generously equipped, too, with fog lights, 18-inch wheels, power driver and passenger seats, and heated front seats. The Subaru Tribeca looks, inside and out, like a slightly more upscale take on the family wagon of our day—the mid-size crossover vehicle. That's to say, it's a little sleek and curvy, but not overtly so, and its styling details—at least on the outside—feel carefully calculated to offend no one. It hasn't always been this way. When the Tribeca was first introduced about five years ago the model had a trend-setting snout, with rounded headlamps and a 'winged' grille inspired by Subaru's aircraft history. Turned out the design was very much love-it-or-hate-it (more the latter), so the Tribeca underwent a major overhaul for 2008, with a more conservative, anonymous front end that shoppers seem to like better. While the exterior of the Tribeca is quite unremarkable, the interior makes more of an impression. A curvy, overtly futuristic (read, already feeling dated) cockpit-like interior of the original model remains; it's a handsome setup in the details, and its ambient lighting is especially extensive. But some might find a bit too much matte-metallic trim, and away from the instrument panel the interior feels nice but unremarkable. The exterior styling of the 2012 Subaru Tribeca all but guarantees it will pass unnoticed in traffic or in a parking lot. From the outside, the 2012 Subaru Tribeca may be the blandest, most anonymous mid-size crossover wagon on the market. Especially from the front, its styling is generic to the point of invisibility. It wasn't also so; when the Tribeca was launched for 2006, it had a "winged" grille design on its front snout that was said to have been inspired by Subaru's aircraft history. Be that as it may, the love-it-or-hate-it styling (more of the latter, frankly) was dumped after only two years, and the 2008 restyle is now in its fifth year. The interior is more distinctive, though, with a curvacious and futuristic dash panel sweeping down into the console to make a pair of cockpits for the front passengers. Like the rest of the Tribeca, that look is now somewhat dated. The details of the design are handsome, with extensive ambient lighting adding a touch of sophistication. Still, many may feel that there's just too much matte-metallic plastic. The instruments are pleasant but unremarkable and, frankly, that applies to most of the Tribeca's now aging design. The 2012 Subaru Tribeca comes with all-wheel drive as standard, and has typically good roadholding and all-weather performance, but its acceleration is only average. 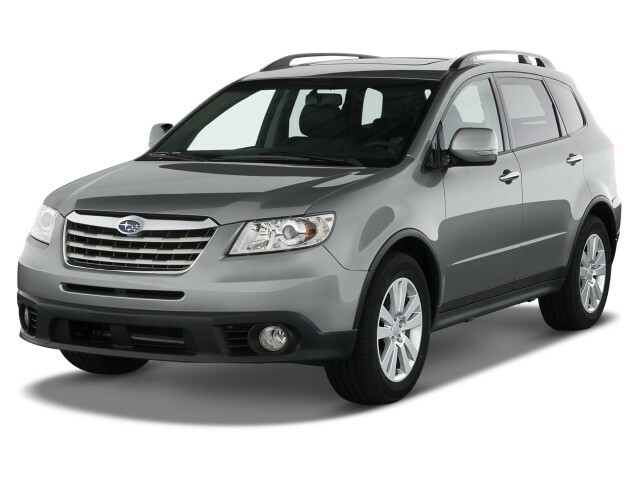 Like all Subaru models, the 2012 Tribeca comes standard with all-wheel drive. And its six-cylinder engine is a horizontally opposed "boxer" design, lowering the center of gravity and giving the Tribeca the same good roadholding as its vastly more popular Outback sibling. The 3.6-liter flat six produces 256 horsepower, and performs respectably mated to a five-speed automatic transmission. 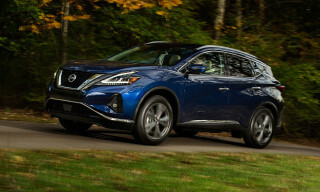 The engine likes to rev, and the transmission is tuned for smooth shifts, so while the Tribeca hardly outperforms punchier six-cylinder rivals like the Nissan Murano or Ford Edge, it's engaging to drive. Push the Tribeca into a corner at speed, and you'll find the body is well controlled and the steering provides more feedback than many of its competitors. 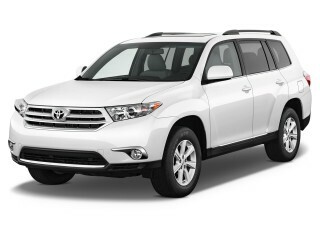 It also offers 8.4 inches of ground clearance, making it well suited to suburban family hauling duties on muddy soccer fields or perhaps rural gravel roads. It's hardly an off-roader, but it should provide good all-weather performance. The front seats of the 2012 Subaru Tribeca are a comfortable place to travel, but second- and third-row occupants will have to bargain for space to accommodate a full seven passengers. Since the launch of a larger and redesigned Outback model in 2010, the 2012 Subaru Tribeca now comes only with three rows of seats, giving it a nominal capacity of seven passengers. The front seats are well proportioned, firm, and wider than expected, with adjustable lumbar supports for both front occupants. The only drawback for taller drivers is that the curved instrument panel restricts knee space, which could get uncomfortable on longer trips. The second-row seat slides 8 inches, and at its rearmost position it provides enough space for adults to sit--though that will restrict the third row to very small people. In other words, to use the third row, adults in the second row will be cramped. Access to the third row is awkward, though grab handles help intrepid riders clamber back into their smaller seat. The second seat back splits 60/40 and folds down, and third row folds flat to expand the load bay as well. The ride of the 2012 Tribeca is smooth and controlled, though on the firm side, and noise suppression is good if no longer class-leading. The 2012 Subaru Tribeca is one of the safest vehicles in its class, though it hasn't been tested under new and more stringent NHTSA crash standards. The 2012 Subaru Tribeca is no exception to its maker's generally excellent record of safety ratings. The Insurance Institute for Highway Safety (IIHS) gave it all "Good" ratings on its crash tests, and standard all-wheel drive and good handling undoubtedly make it more capable on the road than competitors. 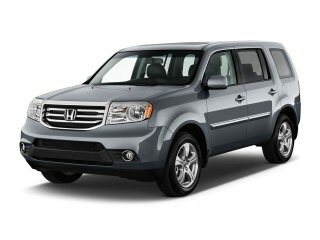 It also includes anti-lock brakes and various other electronic safety systems, and six airbags. The side-curtain bags cover the windows in the first and second rows but, importantly, not in the third row. The one caveat is that the National Highway Traffic Safety Administration (NHTSA) has not retested the Tribeca under its new and stricter crash tests, which started with the 2011 model year. 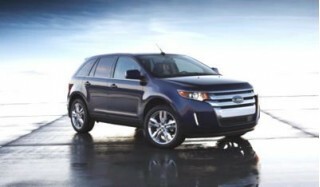 Given its age and chronically low sales, it's unlikely the current model Tribeca will be re-tested until it's replaced. Under the earlier NHTSA ratings system, the Tribeca achieved the highest five-star ratings in all categories of front and side impact crashes. Rear visibility in the Tribeca isn't as good as in the smaller Subaru Forester, and we advise opting for the rear-vision camera, which makes reversing and parking much easier. For a Subaru, the 2012 Tribeca can get pricey at the high end, but the list of standard equipment on most models is generous. Standard features are a definite strong point in the 2012 Subaru Tribeca. There are three trim levels--from the bottom up, Premium, Limited, and Touring--and all come standard with 18-inch alloy wheels, power adjustable and heated front seats, fog lights, and of course that third-row seat as well. All models come with the 256-horsepower, 3.6-liter flat-six engine and five-speed automatic transmission. The "base" Premium model can be optioned up with leather upholstery, a six-disc stereo system, and a separate rear air-conditioning system. The navigation system is not offered on the Premium trim level, however. Moving up to Limited adds standard roof rails for cargo carriers, better speakers and Bluetooth hands-free connectivity for the stereo, a moonroof, leather upholstery, a 50/50 split third-row seat back, and the rear climate-control system. The optional 385-Watt sound system comes with 10 speakers and satellite radio tuning. Finally, the Touring model features seven-spoke alloy wheels and the moonroof, plus the optional navigation system and reversing camera. Base price of the Premium model is roughly $31,000 with delivery, but a fully optioned 3.6R Touring model can run close to $40,000--pricey for a Subaru, though not out-of-line with the highest-end models of some competing seven-seat crossovers. The 2012 Subaru Tribeca is the automaker's least green vehicle, with gas-mileage ratings that are now below the average even for six-cylinder, all-wheel drive crossovers. With only a six-cylinder engine on offer, the 2012 Subaru Tribeca is the brand's heaviest and least fuel-efficient model, and it shows. 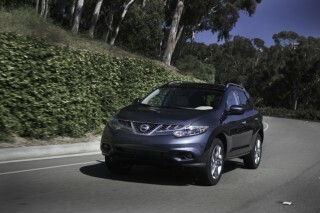 The EPA rates all models of the Tribeca at 16 mpg city, 21 mpg highway, for a combined gas-mileage rating of just 18 mpg. 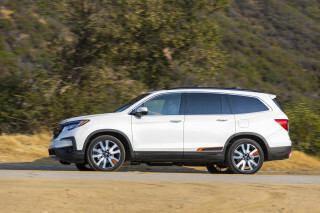 The highway mileage especially is now below the best in the class, and while mid-size crossovers with six-cylinder engines and all-wheel drive are never going to match the fuel economy of compact crossovers, the Tribeca is now below average in gas mileage. One mitigating factor: It runs on standard unleaded gasoline, unlikely certain luxury sport-utilities that specify premium fuel. Looking for a different year of the Subaru Tribeca?